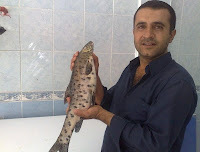 While at work in Hasankeyf last summer, one fisherman found quite a surprise in his net: one of the rarest fish species in the world. Until that July discovery, scientists suspected the little-seen leopard barbel (Barbus subquincunciatus) was long gone from the Tigris and Euphrates rivers. And if the Ilısu Dam is built, its presence may indeed be short-lived; like some 20 other river fish species in the area, the barbel can only survive in a flowing current, not the still waters of a reservoir. What the find really highlights, however, is how little is known about the natural environment around Hasankeyf -- a problem common throughout Turkey, according to the recent report “Turkey's globally important biodiversity in crisis” (pdf), which detailed the massive gaps in scientific study of the country’s ecosystems and flora and fauna. 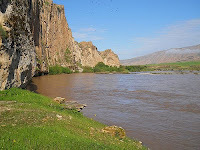 Known wildlife in the Hasankeyf area includes the Euphrates softshell turtle, the striped hyena, and numerous vulnerable species of birds and bats, according to Doğa Derneği, which has criticized the Environmental Impact Assessment Report (pdf) submitted for the Ilısu Dam as severely insufficient. Like the archaeological sites scattered around Hasankeyf, only a small percentage of the area’s ecosystems have been explored, making it difficult, if not impossible, to assess what the dam’s true impact would be -- or how it could be remediated. Many local fish, for example, could probably thrive in a river whose flow was utilized, but not halted, by smaller-scale hydroelectric development. But so far any alternative proposals (pdf) seem to be dead in the water.